Anaheim’s Sky Zone Indoor Trampoline Park is a place that every child has probably been to in their dreams. In fact, there are probably some adults out there who still have that same dream. Just imagine the excitement of walking into a 35,000-square-foot room that’s filled with endless wall-to-wall trampolines. As Sky Zone’s founder states, “You can literally bounce off of the walls!” It’s a 3-D play and exercise experience that is fun for the whole family. 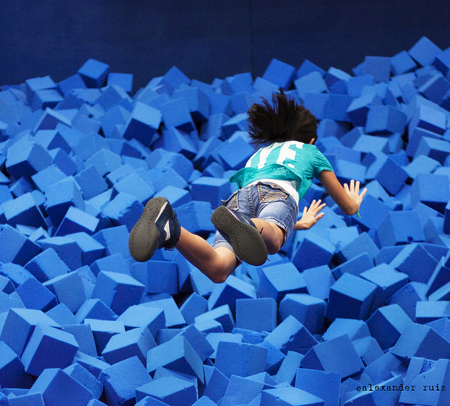 Children and adults alike enjoy the open jump area, 3-D dodgeball, basketball, cage ball, foam pit, and of course, the SkyRobics fitness classes. When you arrive at Sky Zone for the very first time, you’ll be asked to sign up and simply take off your shoes. Seconds later, you’ll be free to bounce your worries and cares away. You can choose to bounce anywhere from 15 minutes to 2 hours. If you do decide to participate in the fitness class, be prepared to break a sweat! Don’t underestimate the calorie-burning power of a good jump or flip. You can burn over 1,000 calories an hour during a single workout. Try doing that on a treadmill! You may have a hard time pulling your kids away, but since it’s probably the first time that you’ve ever given them permission to “jump all over everything”, who can really blame them? Plus, you can sit back and relax in the comfortable parents’ lounge and keep tabs on them by watching the three large-screen TV monitors. Make sure to grab yourself a delicious slice of pizza as well. Your kids will also be excited to discover that there’s a Dippin’ Dots ice cream station and a candy concession stand right there in the facility as well.